As our understanding of the pathophysiological underpinnings of reperfusion injury has increased, many therapies directed at preventing the detrimental effects of this phenomenon have been tested. For primary PCI, this has ranged from mechanical protection from distal embolization of plaque material, preventing calcium overload after reperfusion, to the inhibition of specific inflammatory mediators. Although most have shown promise in smaller mechanistic clinical trials, only mechanical thrombectomy has thus far been shown to be of clinical benefit in larger investigations. Additionally, the occurrence of ventricular arrhythmias poses a threat not only due to (1) electrical failure and subsequent asystole but also because (2) bursts of ventricular activity around the time of reperfusion signify a larger infarct size and subsequent long-term risk of pump failure. Prophylactic treatment with antiarrhythmic drugs has thus far been shown to increase mortality, and investigations are ongoing to improve our understanding of these arrhythmias and to identify patients at high risk that may benefit from treatment. 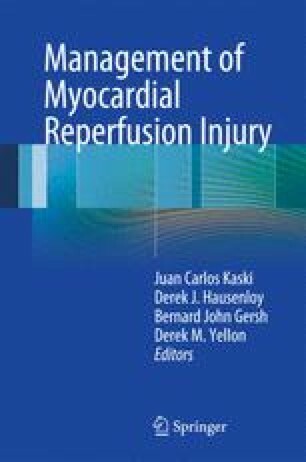 For the prevention of reperfusion injury in coronary artery bypass grafting, the optimum combination of cardioplegic solutions and temperature has not yet been determined. No regimen has been shown to confer superior myocardial salvage over another, with cold blood crystalloid infusion having become the most used worldwide. As in primary PCI, the search continuous for specific cardioprotective compounds and identifying patients at high risk to optimize treatment strategies.